A NUMBER of the region’s athletes returned home with medals from the 2017 UK School Games National Finals in Loughborough. Swimmers led the way with podium places at the country’s top multi-sport competition for youth athletes. Devonport Royal’s Harry Noble (pictured) won a gold medal in the boys’ 50m freestyle event and took a silver in the 100m backstroke. 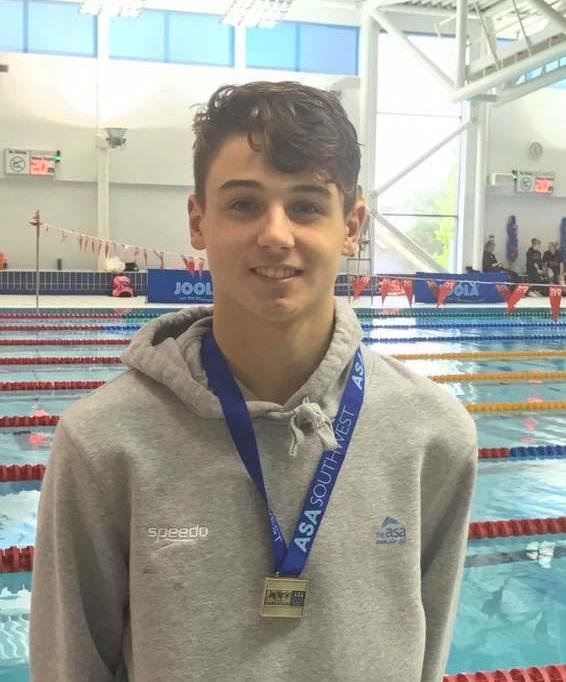 Competing for England South, he clocked 24.79 seconds to touch just ahead of England East’s Reese Housden in the 50m free, before clocking 1:00.21 to take second in the 100m backstroke behind England North’s Charlie Brown. Mount Kelly’s Finlay Middleton claimed two golds in the multi-disability (MC) 50m freestyle and 200m IM. He clocked 30.82 seconds for the 50m and 2:57.00 for the IM race. Fellow Mount Kelly swimmers Athena Clayson and Oliver Traverner also returned with medals. Clayson took silver in the girls’ 200m backstroke in 2:21.68 and won a bronze in the 100m backstroke in 1:05.33. Mount Kelly’s Kaylee Dekker just missed out on medal in Loughborough, finishing fourth in the 50m freestyle. In athletics, City of Plymouth’s Doaa Shayea took bronze in the 100m wheelchair race in 20.39 seconds, but she was second T54 athlete.